Metal grommets size: approx. 5 mm/0.2 inch in inside diameter, 8.1 mm/ 0.32 inch in outside diameter, Approx. 5.4mm / 0.21inch thickness. HIGH QUALITY MATERIAL: Eyelet grommet are made of high quality copper, sturdy and durable, not easy to rust. you can apply them for a long time. 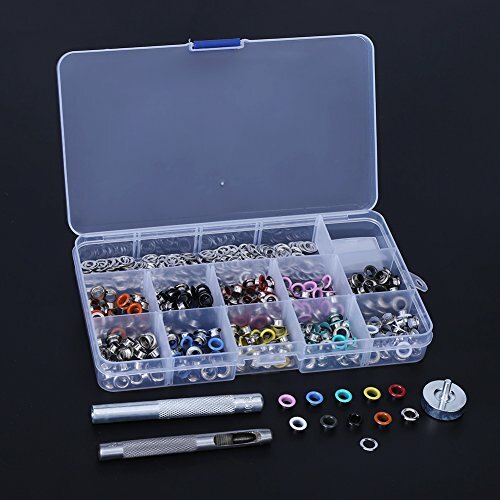 MEET YOUR DIFFERENT NEEDS: Snap fasteners tool set includes 300 set 10 colors grommets with 3 pieces grommet tools, enough for meeting your different needs, for your daily spare and replacement. COMES WITH A STORAGE BOX: All 300 sets grommets and install tools are placed in a clear storage box with removable baffle to separate these compartments, convenient to find the desired ones quickly. WIDE APPLICATION: Suitable for shoes, clothing, shoelaces, DIY crafts projects, canvas, tarps, tents, awnings, and other cloth-made items.